One of my goals before we leave for vacation tomorrow morning was to take down our Christmas decorations. I know this wasn’t a priority, but we’re not coming home until Sunday night, then the next weekend is my last precious weekend before I start up grad school again. 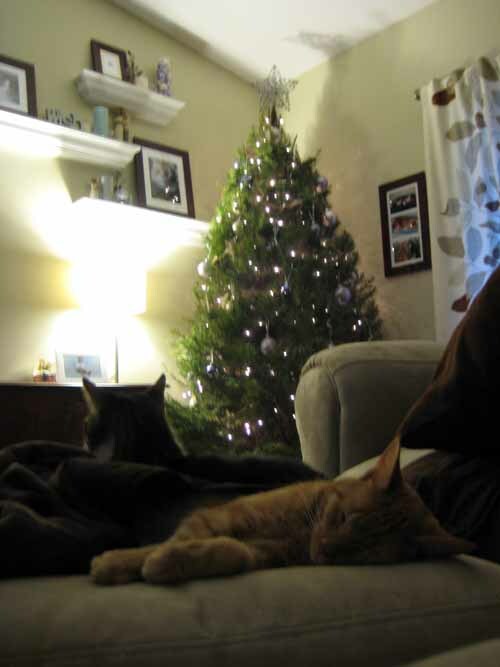 So I’d really like to do something other than focus on taking down a tree… plus it will be mid-January by then, oy! 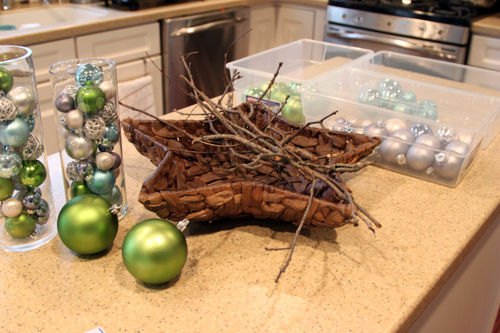 She organized her ornaments by color. Back in our condo, we had tree ornaments and a couple of vase fillers and that was it. 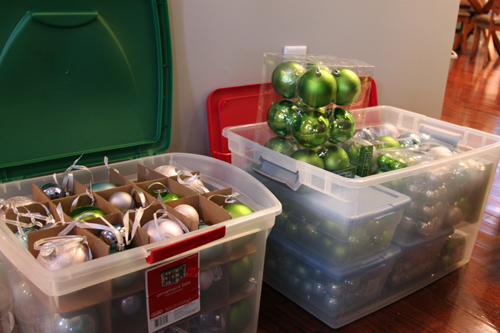 But this year I bought so many ornaments for our large tree and other projects that I was just overwhelmed. So I decided to use Megan’s method as a starting point and started collecting my non-tree ornaments. 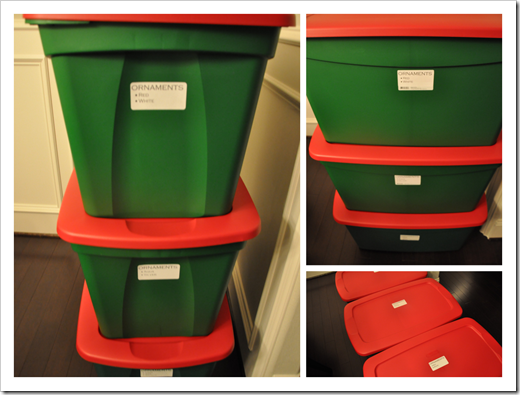 I picked up 3 large Christmas storage bins at Target, since we only had 2 before. I, like Megan, like the Christmas colored ones because when they’re buried underneath things, you know exactly what they are! 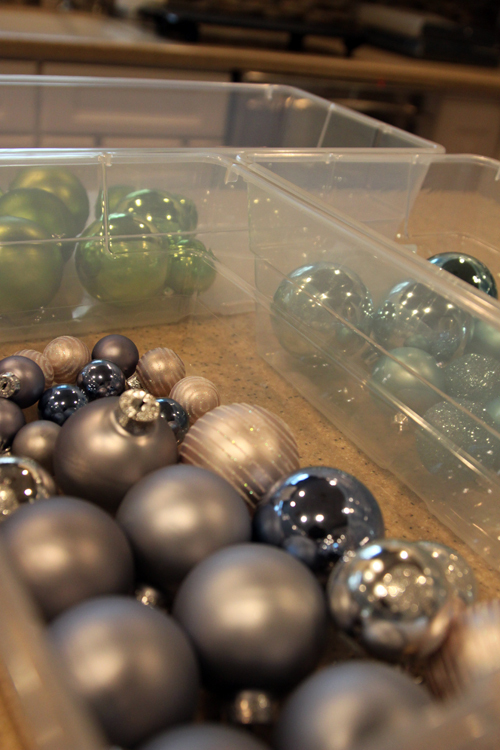 I also picked up some smaller containers for my small ornaments then packed them up by color. I took away all of the other Christmas items on the mantle and in the dining room and just like that, the house was neutralized. 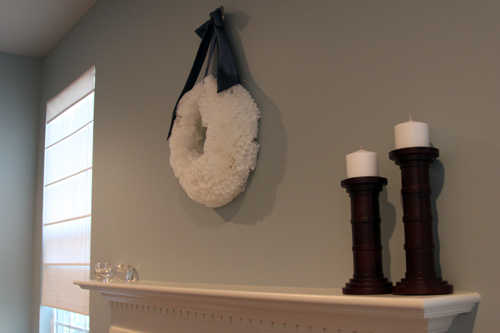 I still need to find a safe place for my coffee filter wreath and tree, so until I get back, it will remain hanging in the family room. 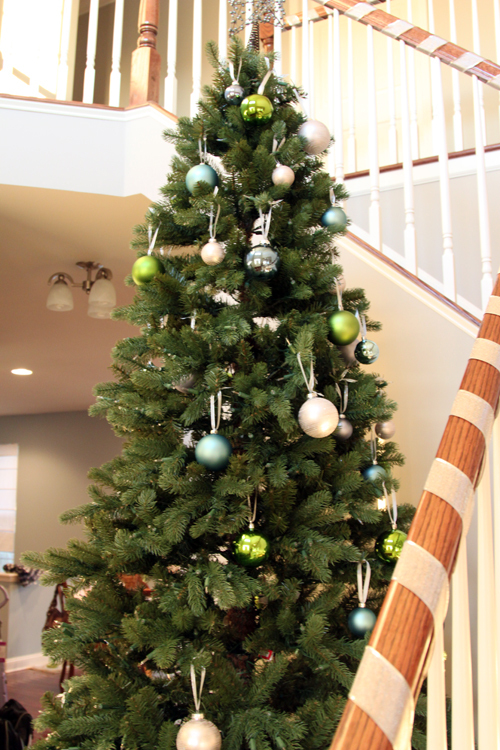 I kept the wood pillar holders, as well as the metallic pillar holders I picked up at Target out because they’re not holiday themed. Most of my candles are in the entertainment center, but I store some larger pieces here, including the silver pillar holders. Oh and we haven’t seen our Ikea Stornas table without an extension in it since Thanksgiving, it looks so tiny with only 6 chairs! As you can tell I put the majority of our things away, even accessories that were out before Christmas. I just wanted a clean slate for when I get back from Disney. On to the tree! I decided to keep tree ornaments separate from vase filler type ornaments, since I strung those ribbon things on all of the tree ornaments and I’m not doing it again next year! I had one ornament box from Target a few years ago, which I decided to start to fill even though I knew I had way too many ornaments on this thing. 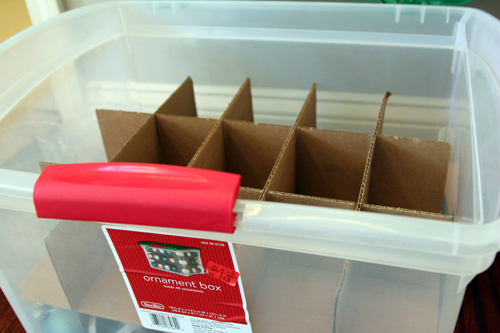 This particular box is a little tight for my biggest ornaments, which is why I almost didn’t use it. So I only put large ornaments in every other opening. Then I filled the remaining openings with 2 or 3 of the smaller balls. I was surprised that a good majority of my tree ornaments fit in this one box! I put the remaining ones in one of the leftover boxes that some of the large ones came in. I actually had all of the boxes from all of my ornaments (even the ones that are 4 years old). I decided to chuck them all this year because they take up way too much space. 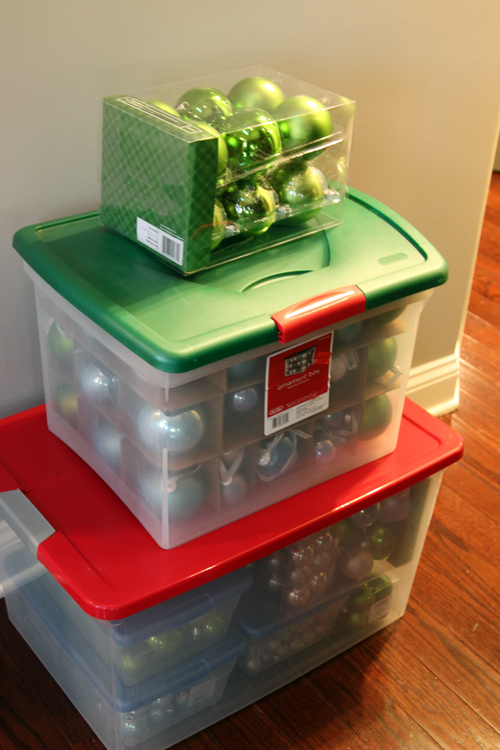 I packed my vase filler boxes, as well as my remaining tree boxes into a larger storage box and it was near perfect, until I remembered I had an unopened box of large green ornaments. See that box of green ornaments messing with my plan? Whaaamp whaaamp. 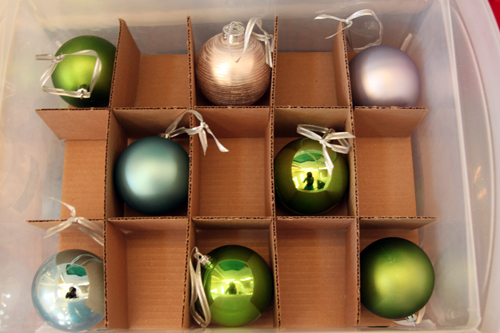 Of course it would have been too perfect to fit all of the ornaments in two neat boxes. The solution? Um yeah, there was no solution. 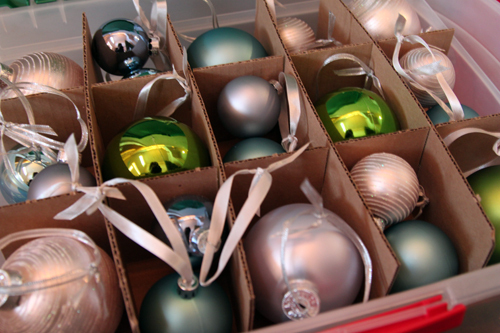 It’s called, I’m going to Disney tomorrow and I could care less if my ornaments are perfectly packed this year. I’m just happy I got it done 🙂 I ended up sticking that last box in a storage tote with some mantel things. The tree is naked, but still standing. 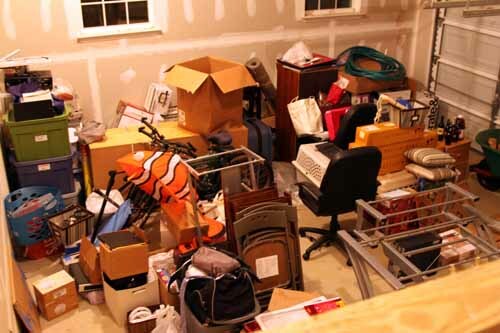 We’ll probably take that apart as well as bring all of this stuff down to the basement when we get back. 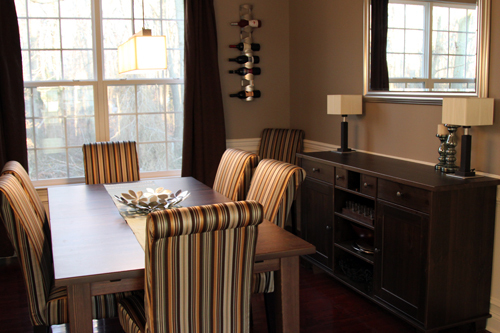 This is part of our house that you’ve never seen, that I’ve been wanting to share since I started this blog. Just finding the precious daylight time to photograph it was hard, but I have short work days at work this week and no school, so I finally got a chance to spend some time in there! 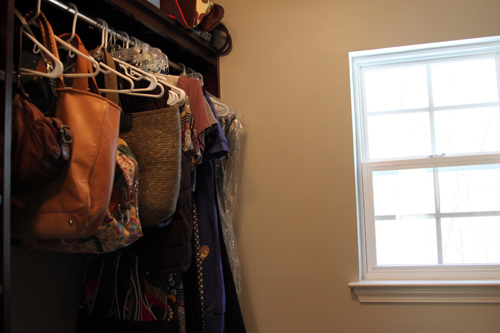 Our walk-in closet was the very first project we tackled here since I knew the 10 feet of wire rack the builder provided wasn’t going to cut it for me. I needed some sense of organization in the house in order to be able to live with the constant chaos in other areas. Mike was okay with just buying some wire racks for his side and that is what we did in our condo. My side had some cheap Closet Maid stuff that eventually fell apart and he dealt with the wire shelving. So I was insistent on doing it right this time, and doing it right away. 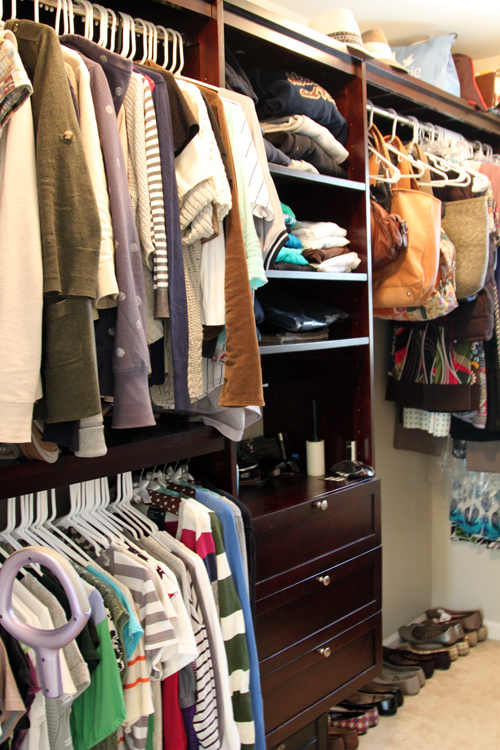 I didn’t want to start with a messy closet and have it be something I’d have to tear apart to organize months down the line. 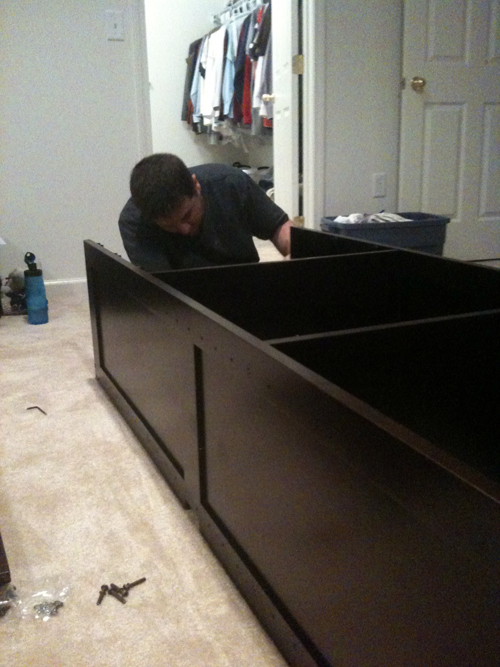 I knew California Closets was very expensive, so we went to Lowe’s and really got lucky. 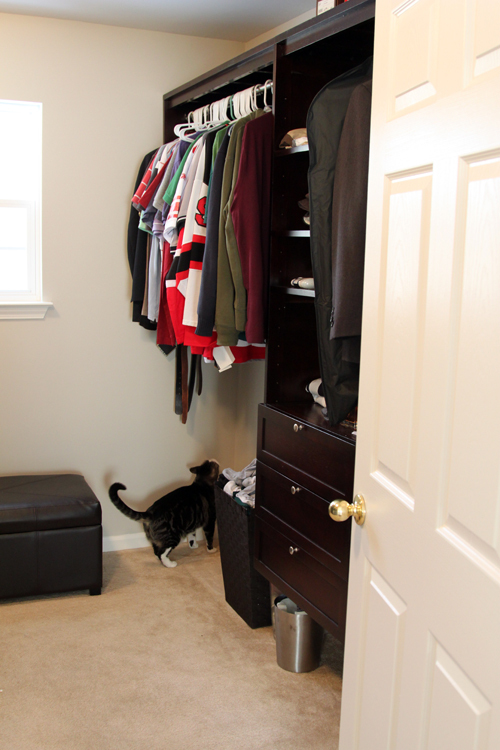 We were able to get this Allen + Roth closet organizer, which had everything I needed. 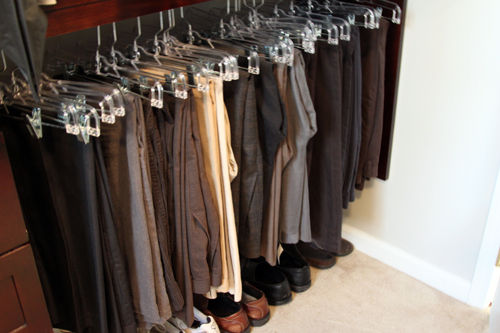 Once we saw this, Mike was convinced that a closet makeover was a good idea. 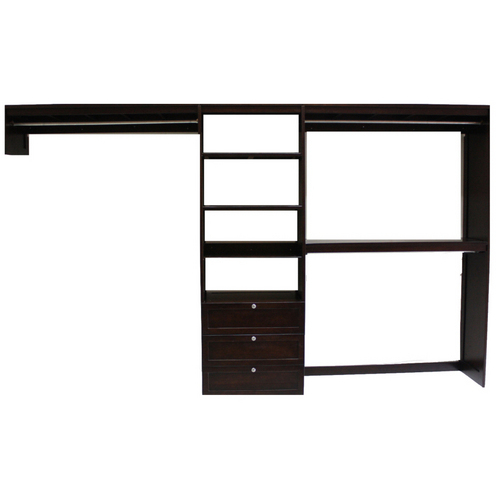 It is solid wood, the same length as our closet, a nice dark stain and had the perfect combination of hanging/open/closed storage. So we picked up two of these back in the spring. We had a rent a truck, pull some muscles, borrow Mike’s brother to get them off the truck, then open the boxes in the garage and take the pieces upstairs one by one because holy hell, solid wood is heavy. 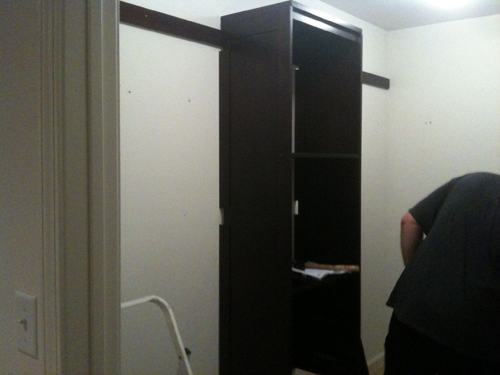 Turns out our floor plan wasn’t exactly accurate and our closet was a little shorter than 10 feet long. No problem though, since the organizer was solid wood and we were able to cut it down. But we had literally just moved in, never even used a saw before and had zero confidence. Mike managed to cut down the wood pieces, using our circular saw on the garage floor since we had no work table to put it on, but we didn’t have anything to cut the pipe piece. So the closet project went on hold for a week or so while we borrowed the right tools. Finally we were able to assemble my side. After a little experience/confidence, Mike’s side seriously took him like an hour. We had both sides up and were really impressed with how it looked. But we realized it would have looked REALLY great had we painted. So we looked at each other, it was about 7pm on a Saturday, and we ran to Lowe’s for a gallon of paint. It was so spur of the moment that I don’t even remember the color. We fully painted it that night, kicking ourselves that we didn’t paint BEFORE we put it up and instead had to navigate in between all of the openings. View from the door, still need a window treatment! Mike’s side, he has less shoes so his side gets the laundry basket and the garbage can. 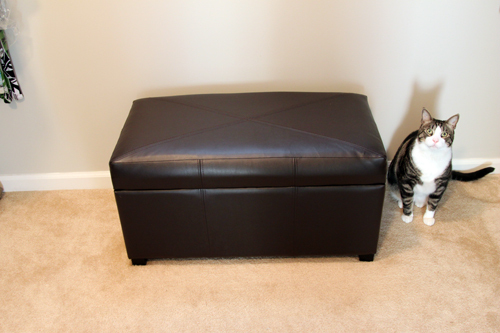 Macky modeling our Target storage ottoman that is home to my flip flops in the summer and serves as a place to sit and put on my boots in the winter. Closer view of my side, we keep a Shark stick vac in the closet and I forgot to move it out of the way. So please ignore the funny purple handle that photo bombed this. 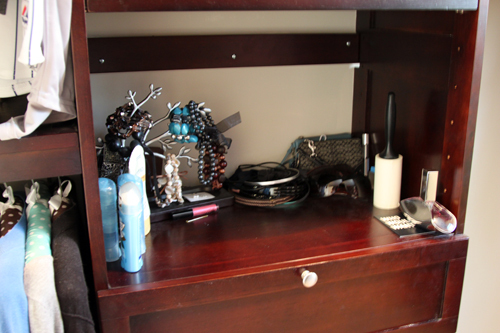 My little accessories area which is currently home to my Target jewelry tree full of my chunky bracelets that don’t fit in my jewelry box, headbands, wristlets, sunglasses, lint roller (essential for a pet owner! ), perfume, deodorant and sunblock (essential for the palest person in America). I am planning on revamping this area soon with some hooks and lighting so it’s a little more organized. The naked window, which has such a pretty view of the backyard. Thankfully the window is small, high and faces the woods! The side of my closet that is home to my scarves, cardigans/other button ups on top and shirts on the bottom. 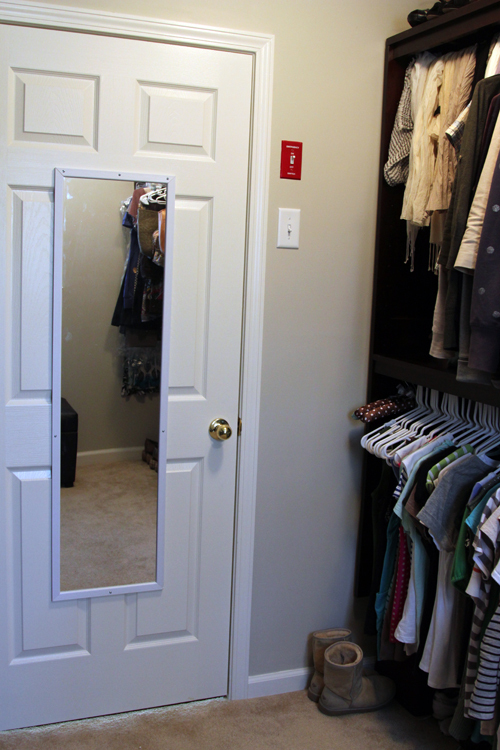 We stuck a cheap mirror on the back of the door, which was an absolute necessity! Here’s the view of our bedroom from the closet. 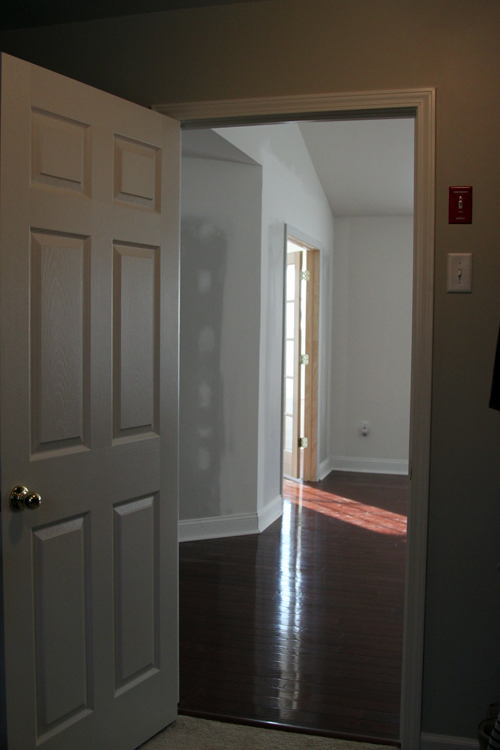 The funniest part of showing people our bedroom is that our walk-in closet is painted, but our actual bedroom isn’t. Baby steps! 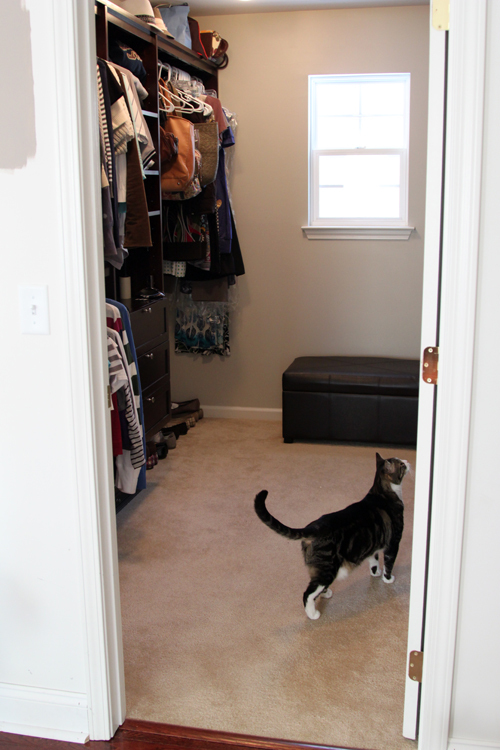 We’re very happy with how our closet turned out. I am almost disappointed that it doesn’t look as good in pictures as it does in person! 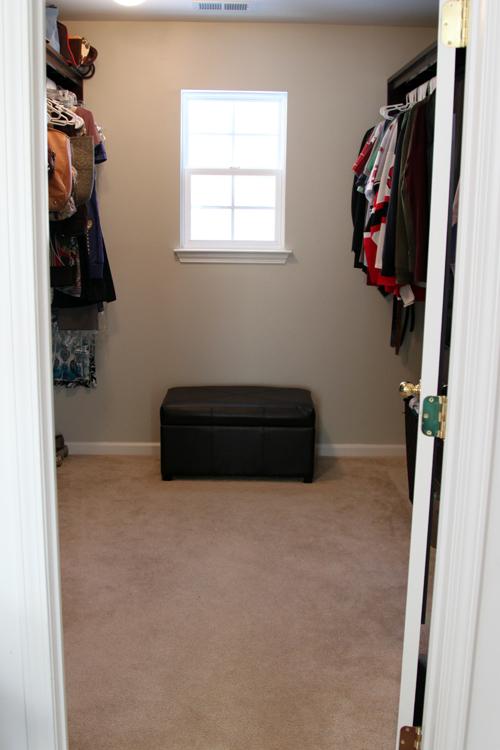 It appears cluttered in these pictures when in reality, there’s so much space and I still have my summer clothes in there! And I loved them. 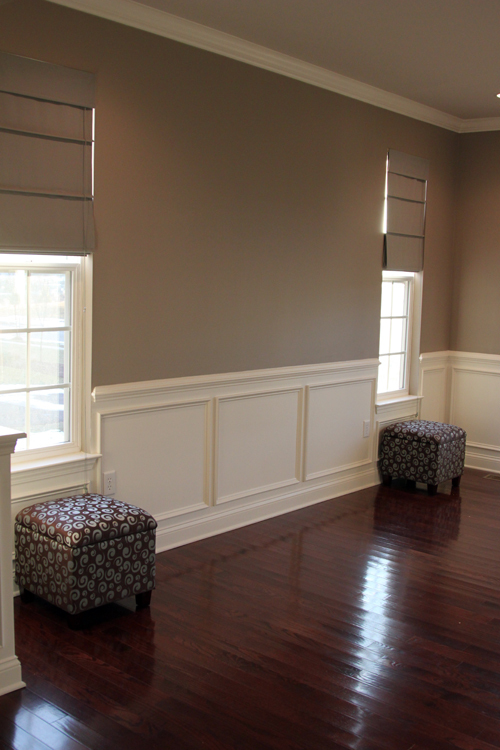 We painted them to match our trim, they were 100% sturdy, easy to hang and looked great. Plus they were a place to keep breakable things away from Macky. 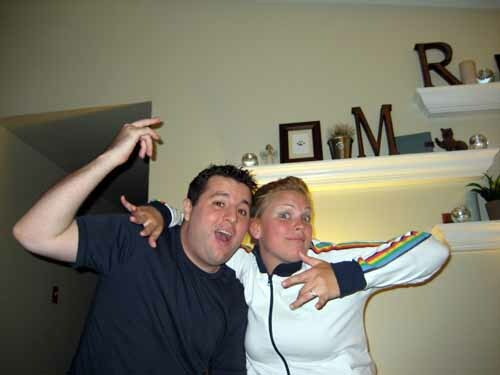 I can’t find the MLS pictures from the condo (they’re somewhere on a CD…), but I found some to share. So when we sold our condo, they were the one thing I really wanted to bring with us. 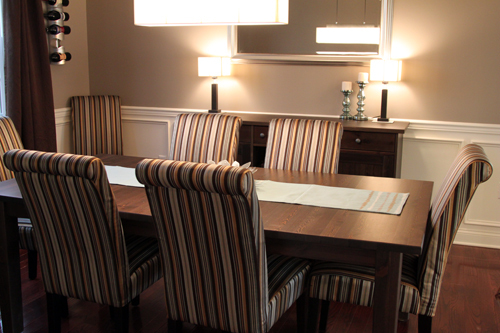 I envisioned them over my Ikea Stornas buffet in the dining room. We didn’t have the buffet yet, but I wanted that thing for YEARS. 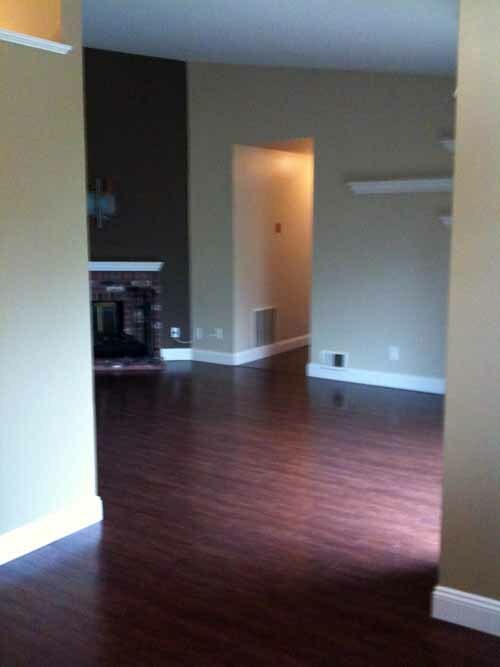 We got an offer on the condo quickly given the market and it was a great offer. 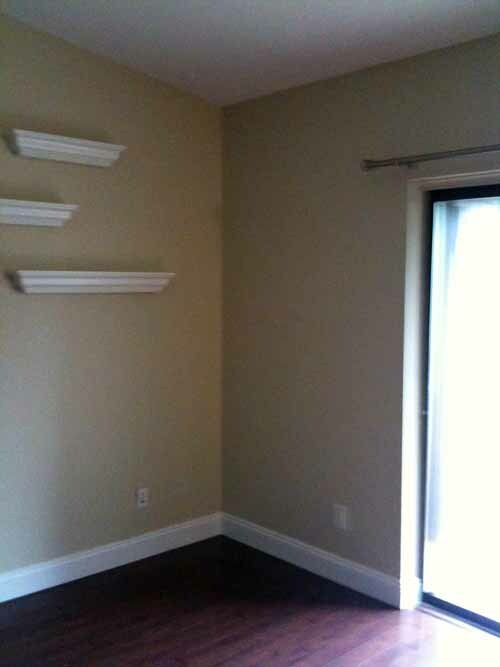 Mike told me the news and then came the but……….they wanted the shelves written into the contract! My immediate reaction? No. At the time they were discontinued and I wasn’t sure we could find ledges of that quality anywhere. Of course I couldn’t be so lucky to find a single picture where the 3 of them fit in one shot!! For months Mike and I considered making them, googled and came up with other solutions (hence the mirror over our buffet). When suddenly, they were back! Pottery Barn had them again! 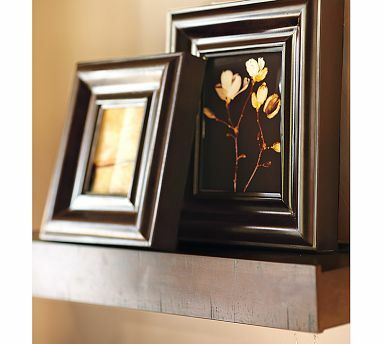 So sometime in the summer, we went to Pottery Barn and picked up the same exact ones we had… a 2′, 3′ and 4′ ledge. Flash forward to before Thanksgiving when Mike had a few days off. One of the items on my Christmas To-Do List was to hang things we’ve already purchased, shelves included. He nicely offered to hang the shelves while I was at work, but wanted to know where to put them. In that moment, I walked into the dining room and had cold feet about our 2, 3 and 4 foot arrangement. Over the past few months, I’ve seen my style change, which is a good thing. I’m learning more, finding more sources and branching out. I think this shelf arrangement has fallen prey to my evolution. 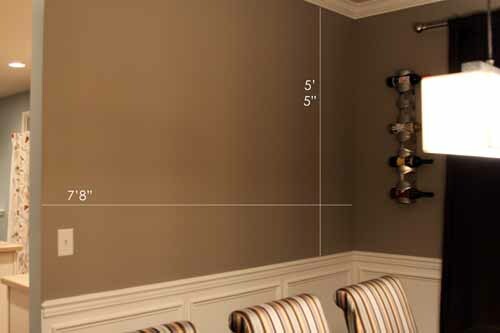 I think I’m leaning towards two 4 foot ledges, so I have enough space in between them to put larger frames, taller vases, etc. Plus I think it would look much cleaner than having multiple sizes. How would you arrange them? 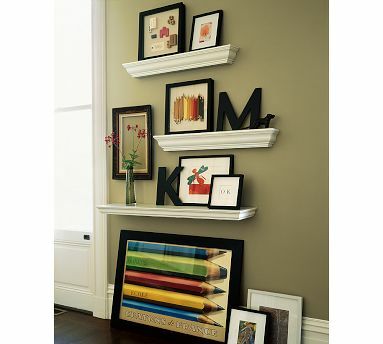 And since I came up with a new question while writing this post, Crown Molding or Rustic Wood? The process was completely overwhelming and we often felt like we were getting nowhere. Those small boxes on the bottom left of the picture? Full of random papers/clothes/unorganized things that were packed in the last minute. So we’d get through a small box, only to look up and see a mountain of things that remained. One of those crates contained nearly Mike’s entire sock collection. Quite funny. 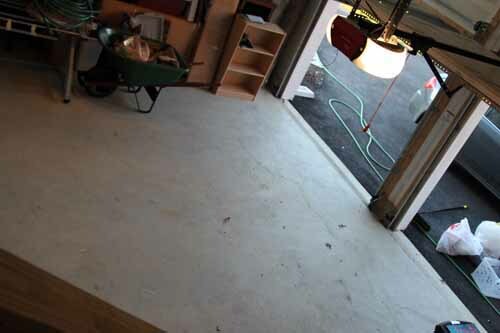 I didn’t go into detail about how our garage got to look like this. 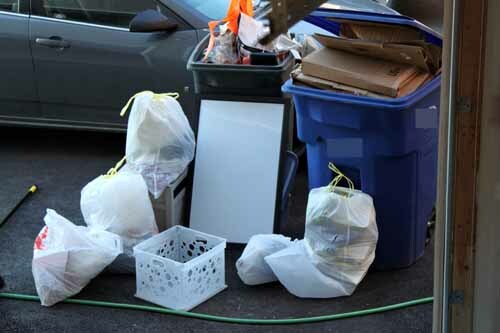 When we moved out of our condo, we were completely organized and the process was seamless. Boxes packed in an organized manner, labeled nicely and put into storage while we all moved in with Mike’s parents for 10 months. The majority of this mess isn’t from our condo move, it is from the move from my in-laws’ to our house. Six weeks before we decided to sell our condo, our worst nightmare came true and Macky began having seizures like his brother that we lost less than a year before. We believe stress triggers them for him and long story short, Sunny once had a seizure while in a cat carrier with Macky and he is know terrified of carriers. So when we moved Macky from our condo to my in-laws’, he had a seizure while en route. So for 10 months, we dreaded moving to our house because we were terrified of losing Macky the way we lost Sunny. We had a very detailed plan, which was to not put him in a carrier and instead put him in the back of my mother-in-law’s SUV with me. It was only a 5 mile drive and we could move him from their garage to ours, without him ever going outside. (Note: I do not recommend this under normal circumstances. A cat carrier is equivalent to putting your kid in a car seat, so please don’t try this at home) So we set a date about 2 weeks after closing because we didn’t want to move him anywhere near the anniversary of Sunny’s illness, which happened to be the anniversary of Macky’s first seizure AND which happened to be their 4th birthday. April 27th is a bad luck day for us and sometimes I am a crazy worrier, but when I told Mike that if our closing date fell near the 27th, we needed to wait to move. He agreed. Two years of bad birthdays for Macky was enough. So we planned, closed on March 30th, emptied our storage unit into our garage and began unpacking. We would unpack after work, then go back to Mike’s parents’ and sleep there with the kittens. Then we got a phone call that the week we planned to move the cats, our driveway would be paved and we wouldn’t be able to drive on it for 7 days. Cue the panic attack. So we ended up moving the cats on during bad luck week. Because of our garage to garage moving plan for Macky, we had to be able to park a car in there. So we quickly pushed things over to one side, moved some things to the basement and managed to get him in the house. We decided not to bring any boxes in the house for a few weeks, so he was as comfortable as possible here. Also so he didn’t know what was going on, we didn’t move any of our things out of our bedroom at Mike’s parents’ before we moved Macky. Elaborate scheme, I know, but he means the world to us. Turns out he moved perfectly fine, though I was crammed in the back of a CR-V with him and had bruises all over my legs from his pacing back and forth, but he didn’t have a seizure! In fact, within a few hours he was roaming the house like he’d lived here all along. Finally, FINALLY, we could be excited that we closed on our house and our whole little family made it here with us. We would run to my in-laws’ after work and quickly throw some of our belongings in a random bag/box. I believe I emptied our bathroom there into a grocery bag in about 5 minutes. 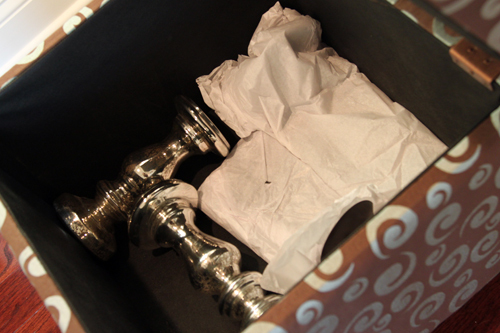 I found a shoe box of things that were in my nightstand, which was not only my nightstand while we lived there, but my desk, medicine cabinet and wedding planning station (Yes, we also got married in the midst of this). Most of this stuff ended up in the garage. 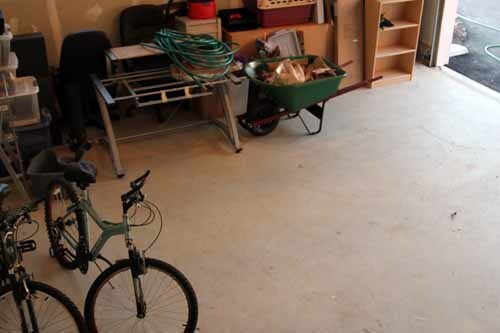 Spring came and went, the hottest summer ever made our garage 100 degrees most days. Plus it was just so disorganized from our hasty box consolidation that two bikes and a dresser blocked all of our smaller boxes. Not something we were looking forward to tackling. AT ALL. Though at the time we didn’t appreciate what we did, we now know that if we need to, we could fit our two cars in the garage and with some shelves/organization system, we’ll be done. It’s a start, which is usually the hardest part…. and it feels pretty good to close the “living out of boxes” chapter of our lives.